Last summer, we had a thought: What’s the best way to get people exercising, without it feeling like exercise? The answer was obvious: hiking. You get out on the trail, the weather is gorgeous, the birds are singing, your worries melt five minutes in. You strike up a conversation with a fellow hiker — before long you’ve hiked three miles and you’re back to the trailhead. Well, that was easy. Of course, you don’t know this before you start. That first experience — the one that determines if you’ll be back or not — is ever-so-important. So we set out to devise a hiking program so beginner friendly you couldn’t wait for your next hike. It needed beginner-friendly trails — not too long, not too hilly, and with not too many tree roots, rocks and other obstacles; it needed hike leaders who were friendly and inspired confidence; it needed to make you feel certain you wouldn’t be left to fend for yourself in the woods. And it needed to be fun. We think we struck the right chord with our first session of Hike NC. 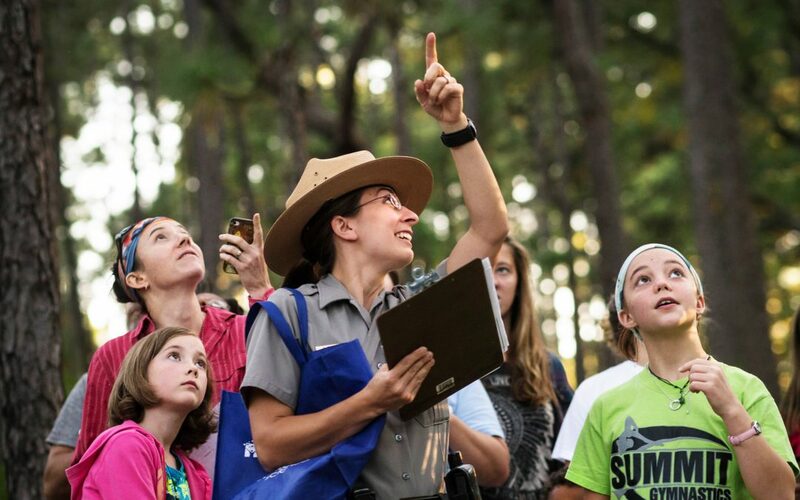 We partnered with North Carolina State Parks, Friends of State Parks, GetGoingNC, North Carolina Recreation and Park Association, and Great Outdoor Provision Co. Our partners helped us discover just over 60 hikes across the state. Experienced leaders from these groups led the hikes. We started in October and hiked through New Year’s Day. We made plenty of converts and, more importantly, plenty of friends: hundreds of people signed up for our hikes! That’s why we’re back this spring with round II of Hike NC. We’ve already had a hike or two, including a series of every-other-Wednesday evening hikes at Umstead State Park that start at dusk and end in the dark (with headlamps!). But the spring season fully kicks off March 20, the first day of spring and lasts through mid-June. Some hikes, in part taking advantage of Daylight Savings Time, are during the work week and many are on the weekends. We’ll hike in State Parks, we’ll hike in places you likely aren’t familiar with. In fact, we had one hike, on March 11, that was a specially-arranged sneak peek at the Triangle Land Conservancy’s Brumley Forest Nature Preserve. Many of hour hikes are in local natural areas that exemplify the beauty and diversity of North Carolina, yet somehow fly under the radar. Again this spring and summer, our hikes will cater to the new hiker. Most are less than 3 miles in length, most are on natural surface trail that’s kind to the foot. Yet the program offers something for more experienced hikers as well. First, there are those off-the-radar spots you’ll have a chance to explore: Brunswick Nature Park and Abbey Nature Preserve at the coast; Ledge Creek Forest and Brumley Forest in the Piedmont; Bearwallow Mountain and Collier Nature Preserve in the mountains. And we do have some longer hikes on tap, including a 7-miler at Salem Lake in Winston-Salem, 5.5 miles on the challenging Mountain Trail at Pilot Mountain State Park, 4.1 miles at Morrow Mountain State Park. Excited? Check out the 70 hikes we have slated for spring at GoHikeNC.com. And we’ll expect to see you on the trail!